I hope this gets good reception because it's a gem! Idolish 7 was originally a mobile game released by Bandai Namco in Japan, featuring a visual novel and rhythm game type game play. It is a Japanese only mobile game, however you can play it if you live in other countries to find out how visit the Idolish 7 fan wiki. But anyway onto the review, this show so far is great! The animation is smooth and the music and sounds are nice as-well. And all the characters are colorful and have distinct personalities. And I especially like that they did give Tsumugi the main female character a personality because they usually don't and make them very bland. But Tsumugi has character which is nice. And I don't have any complaints. Like I said this is based off a game so I feel like you would be more excited about this anime if you played the game and have listened to the many songs by the idol groups(Idolish7, Trigger, and Re:Vale.). Anyway I recommend this anime if you like idol anime and like bishies. a seriously good idol anime! and with characters that have personalities! This anime is based off the rhythm and visual novel mobile game released a few years ago in Japan. It has gained a huge following, and for the fans, this anime has been a long time coming! As a fan of the popular Uta no Prince-sama, and a veteran male idol anime watcher, I can honestly say that this one is a serious gem! While following the story of this 7 man idol unit (get it? Idolish7) we start at, just like the idol group, the beginning! It's all about trying to get their name out their, worry over other idol units, and how to work together as a unit themselves. And to of course, be top idols! This anime shows the real struggles of trying to make a name for yourself versus just them "magically" becoming the best. They aren't the best right now, they are unknown and are working hard to figure out the entertainment world. I know a lot of idol anime characters tend to lack personalities and/or not have any depth beyond their set image. But with this anime it's not like that at all! Every character (even the main female, I know a total shock) has a set image but they are not one-dimensional in their personalities or struggles! It's a refreshing good idol anime that has good animation (there is some CGI during some dancing parts but it isn't all that bad), plot, music/songs, and actual characters we can sympathizes with and not just annoyed at! I think for any idol lovers and even first time watchers, would be able to enjoy this! I love the characters in this anime - they feel down to earth and not vague in personality - there's something more defined in their ambitions and they have, dare I say, some common sense? It's not just pretty boys living a lavish lifestyle as an idol, they're buckling down and trying to build themselves up from the bottom, but they have such good interactions it feels so refreshing and even relatable to a degree.And, you gotta enjoy that merged first two episodes, it really gives them the time to cement the character dynamics. And our female manager is focusing on her job instead of being in doki doki otome cliche situations, so that's always a plus! I'll be sticking with this in the long run for sure. Honestly, this is the first time I've ever enjoyed an idol anime so much as to watch it past episode five (coughutanoprincesamacough) and I fell in LOVE. The boys aren't bland and are all extremely charming in their own ways. They all have unique backstories that can really describe why a character acts a certain way! Along with that the main female protagonist doesn't drive me crazy and is actually a girl who can do her job and not be useless. Which makes me glad this isn't a reverse harem, like I love the reverse harem genre, but I hate the trope of the main female being useless. Other than that, the plot is very dramatic but is still filled with some really cute plot points that just keep you watching. Plus just watch the anime. It's bishie galore and it's beautiful! As I read some of the other comments, I realized there were a few saying it was like every other idol otome anime/game. The main girl does not go chasing after the boys at all and they aren't trying to get with her. Of course there are some flirty remarks here and there, but the boys are much more interested in trying to succeed as a group rather than get her to notice them. The mobile game is amazing and I still play it today. Even in the game itself, you aren't trying to get the boys' attention, you're just going through the story as well as the rhythm portion. It's really fun to collect and merge the character cards too! I would recommend both to anyone! IDOLiSH7 is a great anime for many reasons, but I would say its most appealing factor is the amount of effort that went into each character's stories, and how these stories all work well together. The amount of work that went into this anime is easy to see and it's very admirable, not to mention the songs are really catchy and fun. It's an anime where you can't wait to see what happens next, but at the same time it is relaxing to watch. I really hope this series continues for a while! One look at this and one may think that this is your typical idol anime. A group of boys all fall in love with the same girl and their road is laid out to them in a rainbow where their first concert will have thousands of screaming fans just waiting for them. That they will defeat all the previous guys in a battle of popularity and get bigger than them. Blah blah blah. You know, that typical idol stuff. I rarely watch anything reverse harem. When I do, I either think its okay and probably never watch it again. IDOLiSH7 has me going back to rewatch episodes while waiting for the next episode. This idol anime actually has a plot. SHOCKER! Though I can say that some stuff may be slightly exaggerated, many of the small details are based on real life in a way. The way the fans are portrayed; the struggles to be in the idol industry; how personal problems are dealt with (not all but some). The best part? The guys didn't fall in love with their female manager (which I'm to assume is "you" on the video game). They love their manager as what she is: their manager. There might be a time where one hits on her, but it's not cheesy and it's brushed off. I'm not saying that I usually hate the female protagonist. I don't. But this is refreshing. It's nice to watch an idol or any reverse harem anime where the guys don't "fall in love" at first sight. 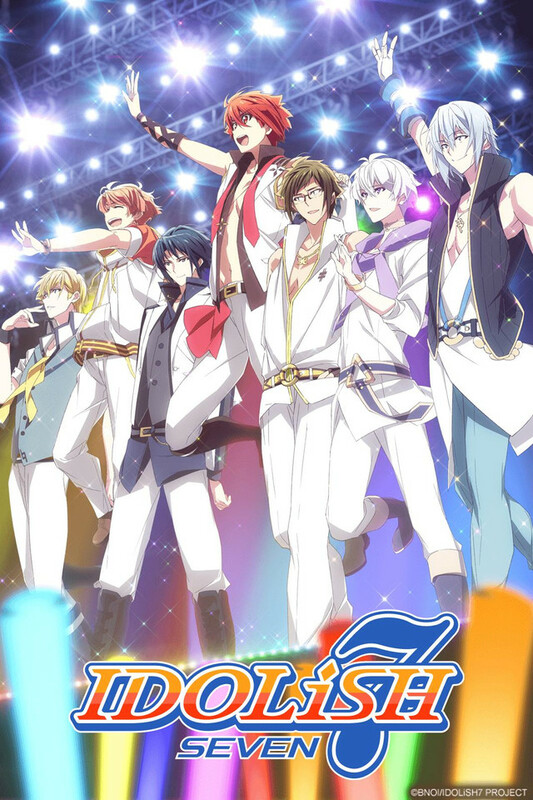 If many don't like the typical plot of an idol anime but want to give one a try, I suggest IDOLiSH7. And I will say, as a fan of a kpop group, this hits me right in the fandom feels. You can't help but love them all. I got into this late and at the suggestion of a friend. I thought it was supposed to be an Utapri ripoff and wasn't that interested for a while. But I was mistaken. The fact that there's seven idols and they're rainbow colored is about where the similarities end. This isn't really an otome show, and that makes it a breath of fresh air. It's rich in terms of drama and incredibly funny moments and the characters each have so much going for them that it's hard to choose a favorite. If Nana and Utapri had a lovechild, it might be this show. I haven't gotten this into an anime in many years. It's splendidly made and has catchy songs as a great bonus. I love this series . I've followed IDOLiSH7 since before the anime aired and watching it has only made me appreciate it even more. TROYCA has done an excellent job capturing the heart of i7 and bringing the story to life in a whole new way. If you're even a little curious, me and this 5 star rating highly recommend you give it a try! I dearly love this series and I am heavily anticipating season 2! Please. I love Re:vale so much and I want to see them so bad.